Q: First off, I’m a bit confused about your work on earlier CRPGs. On your website, you state that you released a game called DND back in 1977, programming it in BASIC under the TOPS-10 operating system. Could you talk a bit more about your development of this game, such as what influenced you and what other CRPGs (or tabletop RPGs or wargames) influenced you? My research is rather sketchy on CRPGs available for mainframes during this era, so any information you can provide will be very helpful. 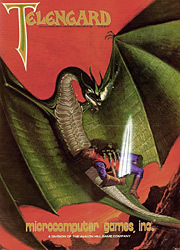 A: Well certainly I had played Dungeons and Dragons™ the paper game put out just previously by TSR. DND as a game evolved from a simple beginning showing where your character was and grew, adding creatures, specials, better displays in response to the suggestions of the players at the ENAD (engineering administration building) at Purdue where I was a freshmen. That summer I took it home and ported it to the Decsystem-10, which is the version that ended up getting handed around so much. Q: There is also another program called dnd that was apparently written by Whisenhunt and Wood back in 1975 for PLATO. Is there a relationship between these games other than the names? I’m guessing that their “dnd” and your “DND” are two entirely different games. How does your game compare to theirs? A: Not to my knowledge at the time. I did not know/see the other game, but note I was in the same area of the country as they were. Some of my play testers may have well been giving me suggestions from their experiences elsewhere. Q: It’s been pointed out to me that Telengard features “procedurally generated” dungeons rather than “randomized” dungeons. I’m not sure I understand the difference. Can you please explain? A: When I reproduced DND on the commodore Pet (8k RAM) I certainly had no room for the dungeon maps stored in the data files back on the main frame. Take your character’s X/Y/Z position, do some math involving prime numbers, pick out a few internal bits of the result and there you have a description of the current location! Q: You say on your website that your Telengard game predates both Wizardry and the Temple of Apshai series. Are you certain of this? Also, what about Garriott’s Ultima and earlier Akalabeth games? The reason I’m asking is that mobygames and other sites list Akalabeth and the first Apshai game coming out in 1980, whereas to my understanding your game was released in 1982. Any clarification you can offer here would be immensely helpful. I’m also wondering if you played these other games, and what you thought of them. A: DND was written in 1976. Telengard was written and played locally by myself and the local crowd in 1978 when the first Commodore PETs came out. I had ported it to the Atari 800, the Apple ][+ and the TRS-80 before it was noticed by Avalon Hill and licensed for marketing. Q: One of the many interesting aspects of Telengard is it’s “real time” gameplay. What influenced your decision to make the game set in real-time, and why do you think it took so long for CRPGs to return to real-time? A: In the terminal room where it was play tested, we had a limited amount of time on the machines at a session. Also the people player were quite competitive with each other. The real-time aspect was to get them moving and not hog the terminals. It just got carried over to the microcomputer later. Q: Telengard is often described as a “pure dungeon crawler,” without a story or quest to drive the action. Do you think that stories and characters just get in the way of a good CRPG? What do you think of story-heavy CRPGs? A: In 8k of memory there was no room for a story. Today there should be a story in CRPGs, but unlike most of them out there now, it should not be a static story preprogrammed into the game, but a dynamic one created on the fly by the motives and personalities of the actors (NPCs) within the game setting. Q: Can you describe the challenges you faced in making a CRPG for the early home computers? It must surely have been a challenge to go from mainframe programming to the Commodore PET. A: Memory, Memory, Memory. I had to get the maximum play out of the smallest amount of code. It is one very dense hunk of BASIC programming. Q: What was it like working for Avalon Hill back in the early 1980s? They were obviously a big publisher of wargames, but how did you fit in as a computer programmer of CRPGs? A: I did not work for them. They saw my game at a gaming convention where I was running competitions and demonstrations and they approached me and solicited the game for resale. Wow, excellent interview. I especially like his comments on modern gaming... too true! All this memory, and they're not using it properly. I had read on a page at some point that someone may be working on a PC re-make of Telengard. Any truth to the rumor? I would hope that anyone pursuing such a project would ask Mr. Lawrence prior to starting. Hm, I think I have his name spelled wrong on my website... the place I got it from had it as "Laurence"... I'll be sure to update that. Wow, that was a very nice interview. What always strikes me is the enormous limits in hardware (especially memory) programmers had to battle with. I am convinced this brings out the best in programmers - making them very inventive and creative. Today with tons of memory to go by it's a whole different story, but so is the gameplay. It is hard to compare these old games to todays games as they are vastly different in both gameplay, lines of code and number of people involved in the dev-team. Thanks so much for the interview. Telengard is one of my favorite games of all time (surprise, hehe). Hate to be the bearer of sad news, but the world has recently lost the Grandfather of CRPGs, Daniel M. Lawrence. He passed away in Lafayette, IN, where he has been living for the last few decades since his time at Purdue U.
I spoke w/ Dan once about possible ports of Telengard.. He DID make a PC version. He lost the source code, unfortunately, but the binaries are available for download. Grab it while you can.. there's no telling how long the website will remain up or how long the files will be available.. ENJOY, everyone! I know Dan would want you all to enjoy it.. If I find other source code, I'll try to come back and post here again. That's terrible news about Daniel Lawrence. Thanks for the update! Dan's servers will still be available, he left them to a trusted friend and he will be moving them soon. Dan was a great friend and I will miss him greatly. Actually, I have one of the source versions of DND from my college days (being a software pack-rat), and recently finished a complete reimplementation in Java. And, yes, I did discuss it with Dan shortly before his passing (I also sent him the old source, since he didn't have a copy). He was quite happy for me to do my project and wished me well. I'm quite sad that Dan didn't live to see it, and to kibitz on its evolution. I hope you have had good luck with your development. If you can, please give us an update. I don't totally understand why I have a copy of Call of Duty, but I still play DND. I never played the live dice-based game, but I got started in the late 70's on a DEC PDP and it must just take me back to simpler times. In any case, I appreciate the fact that others still love this game, too. I thought I was a little crazy, which may be the case no matter what. But, it's great to find out that others still appreciate what was once a software revolution for computer lovers in the formative years of I.T. Since there was a new comment here, that reminded me that I was recently able to procure a boxed copy of a previously little known (or even mostly unknown since its release) Heathkit CP/M version of Telengard for the Heathkit/Zenith line of computers. A few copies popped up from a Venezuelan warehouse and were put up for sale on eBay. One copy found its way into my hands and another Heathkit collector I know from a mailing list. I don't know where the other two copies went to. Anyway, Avalon Hill had a surprising amount of support for Heathkit CP/M (I own three different boxed AH games for the platform), though Telengard was perhaps the biggest surprise because I know of no other sources that were aware of its existence, which is quite odd for a game that's been so heavily documented and gotten the fansite treatment and what-not.